If you want to tap into the religious spirit of a country, you can go to its churches and mosques and listen to the words of its preachers and imams. But the lived religion of a nation is just as accessible on the streets. On my recent visit to Kenya, I saw lions and leopards lazing in the Samburu National Reserve and hyenas chomping on flamingo bones at Lake Nakuru, but my spiritual safari was equally intriguing. While touring through the highlands north of the capital city of Nairobi I saw religious fervor on hand-painted street signs ("El Shadai Dressmaker" and "Bismillah Butchery") and the ubiquitous minivan taxis known as matatus (nearly as deadly, I might add, as the crocodile). Thanks to the rapid growth of the spirit-filled Christian style known as Pentecostalism, Christianity is running wild in Africa, expanding from 9 million to 355 million souls over the course of the twentieth century, and Kenya is no exception. 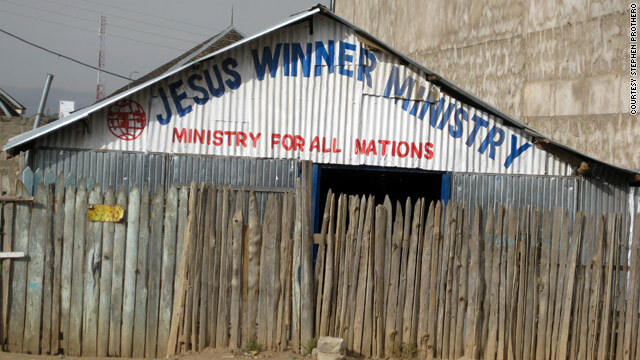 My favorite was “Jesus Winner Ministry,” outside of Nanyuki in the Kenya Highlands, a micro-church packed on a Sunday morning with Kenyans singing praise songs and literally shaking the makeshift roof. The Kikuyu people of Kenya, the country’s largest tribe, refer to Mount Kenya as “Where God Lives.” That may be. But God lives too in the rush of wheels across sand and stone. Fair enough. I just wanted to say it like it is. The CC are masters of overcomplicating things in an effort to confuse the faithful. It gives them and the faithful more ways to "justify" things. Regarding celibacy for the two groups above, it just clearly does not work. I posted the stats and they show that priests and nuns don't stick to this because it is unreasonable in this day and age. I don't think any less of a priest or nun who has consensual s-ex... in fact I think they are "normal." With regard to those not getting Holy Orders, preaching celibacy is once again a pipe dream. This is precisely why more than 3/4 of all women getting abortions have religious affiliations and why the Bible Belt has by far the highest rate of teen pregnancy in the country. It does not work. The CC is CAUSING abortions, is CAUSING S-TD's, is CAUSING HI-V/AI-DS, etc, etc, etc by not properly educating their flock about safe se-xual practices because they are too busy preaching abstinence and threatening hell for these sinners. Do you know how many people the Pope has murdered by saying that condoms don't protect against S-TD's/HI-V? I'm not saying that you don't take your faith seriously. What I'm saying is that they go out of their way to confuse the flock. For instance, I got up and felt like I needed some infrared radiation help this morning. So I decided to plug in my radiation device to an electrical outlet that was capable of handling the voltage necessary to operate it. It uses a nichrome wire that is wrapped around a mica sheet back and forth and back and forth. The nichrome alloy is important because is will not oxidize under the heat from the radiation. So I decide to get started by depressing the mechanism that triggers the radiation to begin. Once depressed, a metal tab on the mechanism connects with an electromagnet to keep the mechanism lowered while the radiation begins. The power runs into a circuit board comprised of transistors, resistors and capacitors. After setting the length of time that I want the radiation to continue, a timer then releases the electromagnet and the radiation ends. In case you were interested, I just described to you how a common kitchen toaster works. That is what the CC are masters of doing. They so over-complicate things that it is amazing. You referring to the "discipline" vs "doctrine" above is an example of this. Do I need to know all of that information to simply toast a piece of bread? No. I walk in, put a slice of bread in, push the button down and wait for it to pop up. Both the simple explanation and the complex one lead to the same result. Keep in mind, back in the day of Jesus, people weren't educated like they are today. A child in grade school today probably knows more about the earth and our universe than the vast majority of adults back in Jesus' time. That is PRECISELY why Jesus spoke in parables. Jesus needed things to be simple so that EVERYONE could understand. Now with that said, what percentage of Catholics understand the Catholic "rules" with 100% accuracy? I'd guess it is way less than 1%. Heck, even most of the priests don't know all of it 100%. You are obviously well versed in it and yet if the Pope gave you a quiz on all of it, you couldn't pass 100%. Do you not see an issue with this? Why are they making it so ridiculously complex that the average person can't grasp all of it? Is that really even remotely similar to what Jesus did? And so on and so forth. What percentage of Catholics do you think would even know what all of those are? It would be a miniscule percentage. What percentage of Catholics even know what country Walsingham is in? What percentage of Catholics know what "Knock" is? What percentage of Catholics know what country Mount Carmel is in? What percentage of Catholics know what the word "Perpetual" means? Many adults will know this, but many will not. The vast majority of children would not know. What percentage of Catholics would know what "Succor" means? Hardly anyone. Instead of them saying, "Our Lady Who Gives Quick Help in Time of Distress" they go with something that confuses the faithful.... they do this ON PURPOSE. Why? Because it gives them more control over you and the flock. The CC could make this all really easy for EVERYONE to understand, but they INTENTIONALLY do not. The reason for this is because they want it to be as confusing as possible so that you NEED the Church to explain it. If they made it simplified, then people could do it on their own and not need the church which means less money in the basket for them. They are using their faithful for THEIR benefit. I agree with the gist. However, not all temptation is "bad." Yes, and he SPECIFICALLY tells us to pray alone in our room as to not be a hypocrite in public. Jesus' words, not mine. Regarding "choosing" wisely, it reminds me of the scene in The Last Crusade where they have to pick the cup of Christ. One guy picks a beautiful gold chalice and bites the dust while Indy realizes that the cup of carpenter would be a simple wooden cup, not something of extrava-gance. While of course this is just a movie, some wisdom is to be found here. The CC is loaded with gold chalices, etc while the hungry stay hungry. The example of the million dollar wooden chair is a prime example of this. I do know about it. It was one of simplicity, not complex jargon. It was one of unconditional love, not discrimination. It was one of giving, not hoarding. It was one of loving children, not ra-ping them. There is really no need to quote the Bible. Why? Because for everything you can quote, I can quote back equally. If you'd like me to quote how it is impossible for Jesus to have been born, I can do that. If you want me to quote all the spots where God unambiguously commands you to kill, I can do that. If you want me to quote you how Jesus says to pray in your room alone, not in church, I can do that. If you want me to quote how God forgot the order of creation, I can do that. Etc, etc, etc. The fact is that all believers cherry pick out parts of the Bible and blatantly ignore others. The point of the Bible is to get the overriding gist and theme of it. That is to love your neighbor as yourself, live in peace, treat your fellow man with respect, etc. This has not only to do with the cherry picking just mentioned, but also due to the massive amount of info that is lost in translation over the centuries. So why are you funding satan instead of rebelling back against him? What if Satan is the Pope? If I were Satan, that's what I would do. And no matter how much you say otherwise, there is no way to say that the Pope isn't Satan because no one knows for sure. Yet it is possible. "Thank God" for children being ra-ped??? Really? If you are such a good Christian, what are you doing here? Are there no homeless people you could be helping instead? Are there no hungry in your area? I watched Secret Millionaire tonight and there were two old ladies that were running a kitchen for the needy. They donated a massive percentage of their life to helping the hungry. Why aren't you doing that? I have no idea if those ladies were Christian or not, but regardless of whether they read the Qur'an, are atheist, etc they are still FAR more Christian than most of the Christians on these boards. To be a Christian means to act like Christ.... not to run around twisting the Bible to justify your lifestyle. Or on 60 Minutes tonight, they talked about the plethora of families that are homeless due solely to the economy that lost their houses. They are living in cars, without electricity, their children are going to bed hungry, etc. Why aren't you helping them? Do you have no room in your home? Is there no couch for them to sleep on? But hey, keep blogging because I'm sure God will appreciate you pretending to speak on God's behalf far more than you actually helping those who are truly in need. 1) Do you or do you not have room on your couch for some homeless people, kids, families to sleep? 2) Do you or do you not have poor and hungry people in your city that you could be helping instead of blogging here? 3) Do you or do you not have some extra blankets and clothes that you don't use/wear that you could be out giving to people living outside in the cold who need them FAR more than you do? I think we both know the answers to those questions. You can sit there and claim to be a Christian all you want until you are blue in the face, but the realities are that actions speak louder than words and the only thing that's happening here is hypocrisy. If you were a true Christian, you'd be out "doing" instead of being here "talking." Those old ladies I was telling you about on Secret Millionaire were busy cooking for and feeding the needy.... they weren't sitting on CNN talking about what a good Christian they are. Yet some people don't have enough courage to look in the mirror and realize the truth. As for "telling ignorant atheists some truth" as a ministry, there are plenty of homeless atheists that you can "minister" to... get off of your high horse, take some extra food from your fridge, take some extra blankets you have in the garage and go out and give them to the homeless who are shivering in the cold at night while you, "the good Christian," are nice and cozy in your heated home in your nice warm bed. I'm sure Jesus would have left people hungry and out in the cold too. You claim to be a Christian. Being a Christian means being a follower of Christ. Being a follower of Christ means that you should try to emulate him. The facts are that YOU self-impose that label upon yourself. When I had that label on me, I realized that I was just being a hypocrite by having it. Thus, I dropped the ti-tle as there was no need for me to be a hypocrite. The difference is that your insecurity doesn't allow you that same level of self-honesty. What you are doing is akin to saying that you are president of the Beach Boys Fan Club (since they sing God Only Knows, they get to play the role of Christians) and then you say you hate the Beatles (who will represent atheists since Lennon said they were more popular than Jesus). Thus, you love the Beach Boys and hate the Beatles.... yet then you run around all day playing Hey Jude, Come Together, Here Comes the Sun, etc, etc, etc. The moral of the story: You can CLAIM to be whatever you want, but just because you claim it doesn't make it so. I claim to be 24 feet tall, but that doesn't make it true no matter how much I try to trick myself into believing it. So you can run around claiming you are a Christian all you want, but when you are leaving YOUR OWN SAVIOR hungry, cold and homeless, I'll say that you are a hypocrite. So what part of that are you unable to understand? Do the words of YOUR SAVIOR not matter? Are you so daft that you pretend to worship this man to get into Heaven and yet then turn around and ignore what he says and ignore how to get into Heaven? I guess so. In any event, when your day comes to face Jesus and he asks why you left him thirsty, hungry, unclothed, unsheltered, etc... I'd love to see the look on your face. You can't lie to him now and say you weren't aware because I am putting you on notice and since God is omniscient, he knows that I am doing this on his behalf. Good luck with trying to "justify" you way out of that one. I hope you are left handed as perhaps it will make the transition to the left a tiny bit easier for you. So once again, the tone was not directed toward you, but the concept is the same. If we want to quote the Bible, then I ask why are you leaving your Savior cold, hungry and homeless? After all, Jesus himself says that will result in eternal punishment. Once again, his words, not mine. my cravings became. I hope you support our veterans. I choose to believe because I want to. I'm a Spirit believer. I don't crawl on the floor if I'm $6 overdrawn at bank, or if I scratch my Harley. Never the less, the scripture says that there be no divisions smoung us no private interpretation, so peace to you, yadda yadda yadda. And if you can spout a bunch of crap about your belief, then sure I have the right to spout Holy Scripture. Hope you made it this far. My posts are written because it brings me joy, so get over yourself. Getting back to 2 Timothy 2:15 and those puzzles pieces... You buy a jigsaw puzzle, every piece is the truth... it makes a picture just like words create a picture in evryone's mind, right? But what happens when people out of ignorance, or even worse, stupidity – and try to force the pieces into the wrong places? See where I am going here? You could pervert the picture, maladjust it, or even turn it into a false image. Unfortunately, that's what most people in this business are doing today. Why don't you YouTube "rightly dividing the word of truth" and see what a couple of thousand other people have to say? Have you ever bothered to read the Aramaic, Greek or Hebrew translations of this? Good Lord, it's quantum physics of the highest order. Your resident avenging scriptual Evangelist. Do not reply if if don't read read these scriptures carefully. I will pray for you, even if you don't want me to. And if you complete your mission I would absolutely be delighted to hear your comments. Good luck flying through the universe at 183,000 miles per hour, going nowhere, coming from monkeys, or Buddha, or whatever. With love, bye, N and don't forget... Have some coffee and a cookie, lighten up. p.s. Are you a friend of Bills, cause that's where I came from. Thank God the man who took me out of there, after 29 years of hanging around listening to man's tradition, taught me the word. Of course at that point I was seeking and there was no stopping me. By the way, I want you to really chew on this – truth always arouses indignation, doesn't it? I am a Born Again Believer. I was saved by uttering the only verse in the word (Bible) that can save you – Romans 10:9..."That if thou shall confess with thy mouth the Lord Jesus, and shalt believe in thine heart that God hath raised him from the dead, thou shalt be saved." God takes us out of darkness and makes us children of light. But we must share the word and light with others. The sword is God's word and we are either standing for God's word or we are not standing at all. No one will see the light unless we step forward as a Believer and teach them. All Believers have the same things; it's just a matter if we speak the word of God or not. It's not about the world it's about the word and speaking it forth. @SuzieStar....... bible/words does not = any kind of reality. Please provide evidence of what you were saved from and why.....and .... Please do not spout more bible verses at me. I'm Kenyan and proud of it. That's what makes us who we are. I believe that the peace in Kenya can be attributed to how religious everyone is, except for the past clashes but that was a rarity.. No matter who you believe in, we have a conscience and don't rebuke God in public. I lived many years in Kenya and yes indeed, you can and will read all kinds of slogans that reference God and religion. But the Kenyans, though religious, are hardly spiritual. Lying, cheating, stealing, and deceiving are the materials that make up the existing moral fiber in that country. For a country that is consistently ranked near 300 by Transparency International, one wonders what impact religion actually has on its followers. Compare this with the top 5 countries that are consistently ranked as the least corrupt by TI, and you will find that religion has no significant impact in the daily lives of people. The culture of poverty and the culture of ignorance go hand-in-hand. Christianity is still a foreign religion in Kenya, one that belongs to the white foreigner that comes with hand-outs and buy-outs. The majority of them have learned quite well over the years how to walk-the-walk and talk-the-talk of a "Christian," but have absolutey no understanding of the impact it truly can have on a person's inner life when taken seriously. The infection from the Dark Ages continues to spread like an unchecked cancer! My mistake, my bad choose of words. I meant to say; The bible is the word of God, the truth and it has everything to do with reality - but it obviously means nothing to you (Peace2all), "Realty", or to Leah. SomeoneElse – Hi, I just wanted to say that God doesn't look at the outward appearance of a human being. One can be the most educated person with a high IQ, but still be the most ignorant person. God sees the very heart of mankind and even if Africa doesn't have the education that many has, they can be the most educated spiritual people of God that can prophecy, discern the spirit, have visions, interpret dreams, heal the sick by the power of the Holy Spirit that works within them, and call things that are not as if they were and God brings it to pass, but most importantly, they can Love with a Love that the most high educated IQ people can not do. God isn’t interested in the outward appearance or who is the most educated person, He is interested that we know Him, not through religion, but through a RELATIONSHIP through His Son Jesus Christ. When Jesus died on the Cross of Calvary, many have been called, but few have been chosen. One can be the most amazing nicest person in the world, but if that person doesn’t have Christ, he/she is eternally lost. 1 Corinthians 1:27 – But God chose the foolish things of the world to shame the wise; God chose the weak things of the world to shame the strong.